The ownership group of The Old Wayne County Building, located at 600 Randolph Street in downtown Detroit, today announced it has completed the restoration, redevelopment, and improvement of the historic structure. Since March 2016, 600 Randolph SN, a private investment group in New York City, says it has spent close to $7 million restoring the internal and external the building. Plans call for leasing the 87,120-square-foot building to a single tenant. Under the guidance of Quinn Evans Architects and The Christman Company, the building’s unique architecture and distinctive character were preserved and revitalized. 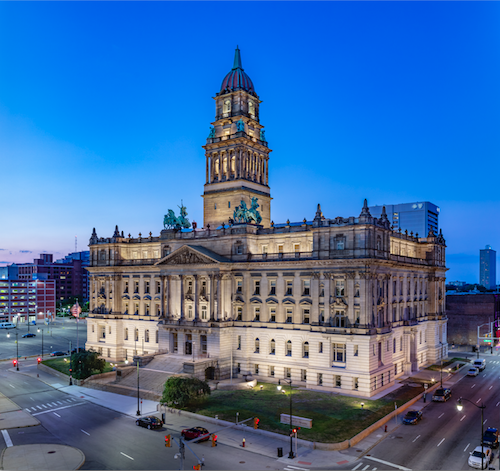 Built between 1897 and 1902, the Roman Baroque Revival structure was a bookend to the former Detroit City Hall (where today site One Kennedy Square), and was connected conceptually by Cadillac Square. “Detroit is filled with so much history, and restoring this important and unique building to its previous grandeur has been an exciting and rewarding journey,” says Moshe Oppenheim, a representative for the ownership group. The building was occupied by Wayne County up until 2008. At that time, the county acquired the Guardian Building and moved it operations. The building has been vacant ever since. The sale of the building at a cost of $13.4 million to the New York investment group included a surface parking lot north of the structure. The lot, located at 400 E. Fort St., occupies an entire city block.